We’re all familiar with IVRS systems that let you access information using a touch-tone telephone. 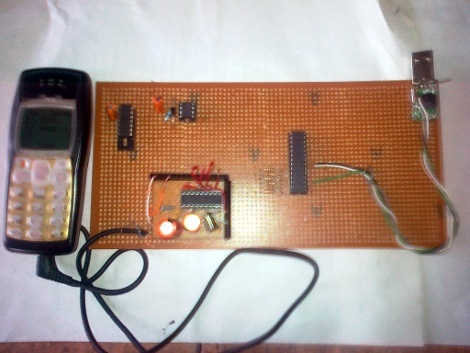 [Achu Wilso] built his own version which uses a cellphone, microcontroller, and computer. 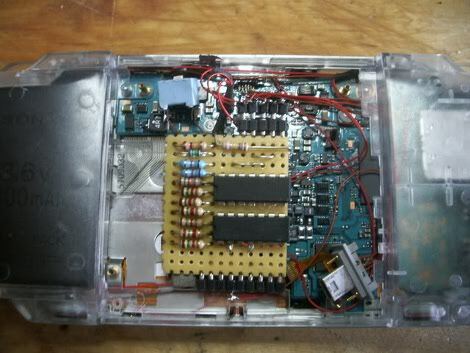 The cellphone is monitored by an LM324 op-amp with an attached 555 timer chip. When a call comes in the voltage on the headphone output goes high, activating the timer circuit. If it goes low and does not go high again for about 25 seconds the call will be ended. Each incoming touch tone acts as a keepalive for the circuit. An MT8870 DTMF (touch tone) decoder chip monitors the user input. An ATmega8 microcontroller grabs the decoded touch tones from that chip, and pushes them to a PC via USB. The PC-side software is written in Python, using MySQL bindings to access database information. eSpeak, the open source speech synthesizer software is used to read menu and database information back to the caller. Not a bad little system, we wish there was an audio clip so we could hear it in action. [Christian Doran] wanted some blinky goodness to go along with the tunes on his PSP. He built a VU meter circuit around a couple of LM324 op-amp chips and fit it into the UMD space on the back of the PSP. Using surface mount LEDs and some fine wire he lined up a string of indicator lights round the circle on the clear UMD cover. As you can see in the video after the break, the back of the case now pulses along with the music. [Christian] notes that building the VU circuit around an LM3915 would have been much easier but he’s working with what he has on hand. Looks like he achieve the effect he was after. If you want to learn a bit more about how the op-amps work, take a look at the tutorial from our links post. [Manekinen] built a very responsive spectrum analyzer. The components at the party are what you’d expect, an ATmega8 does the hard work interpreting data from the LM324 op-amp. This build stands out because it is fast and configurable. In fact, the explanation of the calibration process is where this project shines. Instead of using water, an HD44780 module displays the spectrum data. The device currently supports several different character displays including 16×2, 20×2, 24×2, and 20×2. We’ve embedded a video of a 20×4 VFD in action after the break. As the video progresses, watch for the Polish words that pop up. This corresponds to the brightness and sensitivity being adjusted with the 5-button keyboard.